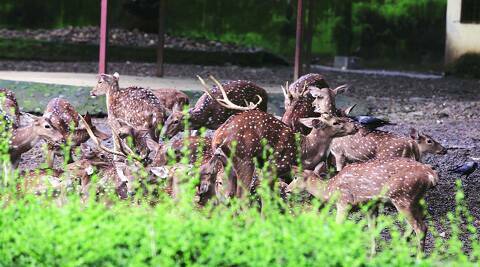 As per records procured from the zoo authorities, 39 mammals, 22 birds and 10 reptiles died at the zoo in 2010-11. Activists and animal lovers claim there is another big problem – poorly trained animal caretakers. Built in 1861, the Veermata Jijabai Bhosale Udhyan and Zoo at Byculla in central Mumbai (formerly Victoria Gardens), is one of the oldest zoos in the country. Of late, however, animals at the zoo are facing a survival challenge. As per records procured from the zoo authorities, 39 mammals, 22 birds and 10 reptiles died at the zoo in 2010-11. In the following two years, the total number of deaths were 34 and 63. Up to August 2014, the number of mammals and reptiles at the zoo have remained the same since 2012-13 at 147 and 32 respectively, but around 61 birds have died in the first six months itself. According to People for the Ethical Treatment of Animals (PETA), a report compiled by the Central Zoo Authority (CZA) says more than 150 animals and birds died at the zoo during a 12-month period in 2010-11. It says the mortality rate (12.10 per cent) is higher than any other zoo in the country. While there is a separate enclosure to treat ailing animals like the lioness Jimmy, who has been suffering from a nervine problem on her hind legs for two years, until two months ago, there was no resident doctor ever since former deputy superintendent of the zoo, Dr M V Karawale, retired six years ago. Zoo officials, however, say there was never a need for a resident doctor as doctors were available at the zoo from 8 am to 6 pm daily. “There was never an emergency at night. We regularly feed the animals and give them the necessary medicines,” says an official. Zoo officials attribute the deaths to the old age of the inhabitants. “There has been no epidemic or virus breakout at the zoo. The birds are 30-40 years old and are dying due to old age. They are fed regularly and their feed house and enclosures are kept clean,” says Dr Komal Raul, the veterinary doctor at the zoo. There are other problems too. A visit by Newsline revealed how injured animals like a hippopotamus and a few deers continue to be kept on display, how rats nibble on food meant for birds and trouble them and crows peck at wounds of animals and steal food meant for the aquatic birds. Also, large water bodies inside enclosures have turbid water, with tree branches lying around. Visitors can be seen carrying plastic waste inside the park. To top it all, an enclosure houses crocodile and Ghariyals (predators) along with sambar deers (prey). Activists and animal lovers claim there is another big problem – poorly trained animal caretakers. Zoo officials, however, say most of its 46 caretakers were trained by their predecessors and they attend regular seminars and presentations by the CZA and travel to the snake parks and other zoos to learn better handling. “Our caretakers have enough experience. They only require scientific knowledge on how to hold the animal in the right way so as to not injure or hurt it,” says Dr Raul. The visit by the Newsline also found several other violations of rules laid down by CZA and the National Zoo Policy. According to the Recognition of Zoo Rules, 2009, every zoo has to regulate the movement of visitors in a manner that animals are not unduly disturbed, stressed or provoked. However, at the Byculla zoo, various officials and policemen are seen moving on motorbikes inside the zoo area and visitors are regularly seen attempting to feed the animals kept inside enclosures and teasing them. Further, the rules state that every zoo shall refrain from display of sick or injured animals, which should be housed in off-display facilities for upkeep and appropriate healthcare. Rules also say that zoos shall refrain from housing domestic animals and pets within the zoo premises and adequate safeguards shall also be put in place to prevent the entry of domestic livestock, stray animals and pets into the premises. The Byculla zoo fails on both accounts. An hippopotamus with a two-year-old injury has been kept on display. As are deers having injury marks. As a result, it is not uncommon to see crows pecking on their open wounds inside the enclosure. Similarly, the bird enclosure housing the macaw parrots have at least three resident rats and even a rat trap. A few years ago, a stray dog allegedly attacked a deer, leading to its death, admit zoo officials. “The management of the zoo has not been satisfactory despite what the governing agencies believe,” says Bombay Society for the Prevention of Cruelty to Animals (SPCA) secretary Lt Colonel (Retd) Dr J C Khanna. A recent report by NGO Plant & Animals Welfare Society, Mumbai (PAWS-Mumbai), submitted to the Central Zoo Authority (CZA) on Monday, has highlighted the state of affairs at the zoo and sought an inquiry and stringent action against officials concerned and caretakers. It has also requested the CZA to disallow any exotic species, especially penguins, to the Byculla zoo. Another major failure of the zoo authorities is their inability to acquire mates for single and unpaired animals or successfully transferring or exchanging animals so that they could mate. Rhinoceros Shiva, who died in June without a mate, an example. Shiva was almost 38 years old when finally shifted to National Zoo in Delhi to mate. This despite the fact that the average life expectancy of a rhino in captivity is 40-42 years. At present, 35-year-old Himalayan black bear, Jamuna, whose mate Mangal died three years ago, and elephants Laxmi and Anarkali are still without mates at the Byculla zoo. Lack of space or facility of a big pond to house the injured hippopotamus and treat it separately is the reason given by zoo officials for it being kept on display despite being injured. “We apply ointment and regularly treat the two-year-old injury, but as the hippopotamus lies in the pond inside his enclosure, the wound takes longer to heal, Moreover, the crows keep pecking at the injury and aggravating it, but we have no other place to shift him and have to work within these constraints,” admits Dr Raul. For the rodent problem, the zoo authorities have placed rat traps inside bird enclosures and try to eradicate the problem with pills buried deep inside the ground to avoid poisoning the birds by accident. “As we live in the city, with markets close by, controlling dogs and cats inside the zoo premises becomes a challenge. It is easier to catch stray dogs, but cats escape easily. We also lay fish baits to trap them. But there is only so much we can do. We need to revamp the zoo,” says Dr Raul. As for keeping the prey and the predator in the same enclosure, zoo officials say that in the wild, these animals live in the same manner. “We have not seen the crocodiles attack the deers even once in the past 10 years. When the animals are fed enough, they don’t feel the need to hunt and if they have been co-existing happily, why is there a need to shift the deers?” says Dr Anil Anjankar, the zoo’s director. After severe criticism, the enclosures for the deer, bear, elephant, Nilgai, sambar, hippopotamus and black bear were readied in 2005 as per the CZA guidelines. These enclosures were provided with moats, the cages around their habitat were removed and their enclosures enlarged. But the enclosures for lion, hyenas and monkeys are yet to be upgraded. Zoo officials also strongly reject the charge that water bodies are filthy. “The animals are provided with clean, potable water inside their feedhouses that public cannot see. The water is changed every day. The larger water bodies seen inside enclosures are cleaned every Wednesday, the day the zoo is shut for cleaning. If the water was dirty, the animals and birds would not drink from it and would die of dehydration, something we have not witnessed at the zoo,” says Anjankar. Regarding transferring animals or finding mates for them, zoo officials say their hands are tied. After the bear’s mate passed away, she was too old to accept a new partner and would not have been able to conceive anyway, they say. As for Shiva, they say when shifting him out of Mumbai was first proposed, it was strongly opposed by political parties and they had to succumb to the pressure, thus delaying the process. Meanwhile, based on the report from the NGO, the Animal Welfare Board of India (AWBI) plans to write to the CZA to look into the matter. However, a similar report had prompted a CZA visit in 2012, which resulted in the zoo authorities being given a clean chit, with minor suggestions such as upgradation of the zoo hospital facility. “We are thinking of writing to the CZA for appropriate action,” says Vinod Kumar, assistant secretary, AWBI. “Irrespective of whether the animals are indigenous or exotic, providing good facilities to them is the most important function of the zoo,” he adds. Zoo officials say the proposed revamp at a cost of Rs 150 crore will take care of most of its existing problems. According to the master plan approved by the CZA, the new enclosures will meet the prescribed dimensions and provide better natural habitats inside enclosures. The proposal for the redevelopment/renovation prepared by the BMC in November 2012 needs the mandatory approval of the CZA and the Mumbai Heritage Conservation Committee (MHCC), owing to its presence within the 150-year-old botanical garden, the city’s only heritage botanical garden. The medium zoo, so classified because it has only 53 acres at present, houses lioness, elephants, hippopotamuses, bearm pythons, deers and aquatic birds. According to the CZA-approved animal collection plan, the new zoo will house exotic animals such as Humboldt penguins, jaguars, African herbivores such as zebras and springbok, which is an antelope-gazelle found in south-western Africa. Animal activists are also opposed to the procurement of exotic species such as Humboldt penguins. Citing the zoo’s track record, Save Rani Baug Botanical Garden Foundation has opposed the existing plan for eating up green spaces to create larger enclosures. Humboldt penguins are native to coastal Peru and Chile, where they love to swim in freezing water, which is vastly different than scorching, urban Mumbai. “The Byculla zoo also has a poor history of care of exotic species. Three kangaroos from Japan died from a viral disease few years ago. For the Humboldt penguin, the BMC will spend Rs 19 crore to provide a temperature-controlled enclosure. Any species that needs life support to survive in captivity does not belong in any zoo, much less the inept Byculla zoo,” adds Dr Manilal. While the CZA approved the plan in December 2012, the MHCC is yet to give its nod. In fact, in July this year, it asked the BMC for various clarifications and directed it to comply with directions to demolish a series of unauthorised walls constructed within the heritage premises without prior permission of the MHCC. Although MHCC’s approval it still awaited, work is already on to prepare tenders for the zoo revamp. The Save Rani Bagh Botanical Garden Foundation has also raised objections to the approved master plan before the MHCC. Their main objections are that several internal gardens have been included within proposed new animal enclosures, thereby making them inaccessible. They also say that the boundaries of most existing animal enclosures have been changed, necessitating needless and harmful demolition and construction activity. “A lot of enclosures were already renovated in 2005 at great expense. So what is the need to demolish them completely and build new ones in their place? Having construction within heritage premises is not warranted. In our July 9 meeting with Municipal Commissioner Sitaram Kunte, he told us that more plantation would be undertaken in the extra Mafatlal plot. We are not asking for removal of the zoo and animals, but only for maintenance of green spaces and use of existing renovated enclosures,” says Hutokshi Rustomfram, a trustee at the Save Rani Bagh Botanical Garden Foundation. The need for a massive revamp has also been questioned by activists since as the civic body and the state forest department have already acquired 110 acres of green land at Aarey Colony in Goregaon to create an extension to the current zoo in Byculla area. A third-party independent committee should be constituted to oversee the day-to-day functioning of the zoo or occasionally audit the zoo management, experts say .”The revamp now seems mandatory as the existing zoo is outdated and the enclosures are not up to the standards. But instead of concentrating on acquiring exotic species, zoo authorities should focus on ensuring survival of the existing, indigenous species. Moreover, the third-party committee should include wildlife experts and CZA should crack down on zoos violating norms,” says Colonel Khanna. Wildlife experts say the revamp should ensure the green heritage space is retained as it is. “This garden adds to the natural environment of the zoo and these trees should be retained, at least for animals, if not for people. It is the biggest green space in the island city and the zoo authorities should take that into account,” says Krishna Tiwari, a wildlife expert.